I've had some people ask for a visual cutting and scoring aid for the T-slide card base. Below is a picture for your reference. This is for an A-2 size card. 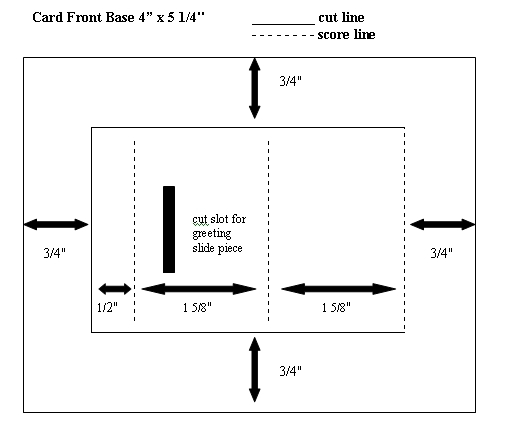 1 1/2" x 3 3/4" sliding message piece (you can vary the width and the length can be as short as 3 1/4" and still work find in the slider) - score one end of the piece at 1/2"
The assembly instructions are the same as my standard T-Slide. When cutting your slot for the sliding message, make sure that the top of the slot is 1/2" from the score line. One of my readers suggested using the word window punch to create the slot. This works perfectly if you line up the bottom of the word window about 1/8" above the score line. Thanks for the suggestion, KT Hom. You can click on the photo for a bigger view. If you have any questions, please let me know. Oh I saw your tutorial on SCS! Congrats! Oh thank you thank you for this. I want to try this card this afternoon and this will be a BIG help. Love your blog BTW, you are an amazing paper crafter.